Barclays Center, Brooklyn, New York - Welterweight fan favorite Julian Sosa made his hometown fans happy in a swing bout, parlaying a third-round knockdown into a shutout four-round decision victory over Erick Daniel Martinez. Scores were 40-35 across the board for Sosa, now 10-0-1 with 4 KOs. Martinez falls to 14-10-1 with 8 KOs. 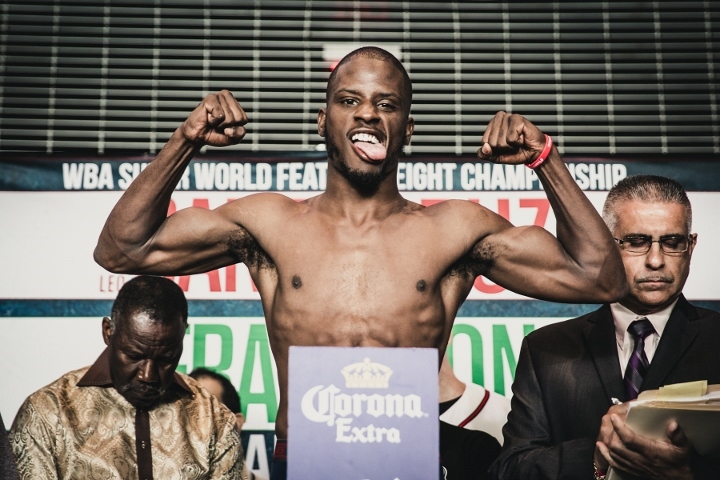 Former world title challenger Tony Harrison returned to action with an eight-round unanimous decision over Mexico's Paul Valenzuela Jr.
Scores were 80-71 and 78-73 twice for Harrison, now 25-2 with 20 KOs. Valenzuela falls to 20-6 with 14 KOs. Valenzuela was durable but provided little for Harrison to worry about offensively in the early rounds, which meant he took a steady stream of punishment - particularly to the body - from the patient Detroit native, who was back in action for the first time since a losing effort against Jarrett Hurd for the vacant IBF 154-pound crown in February. In the fifth round, Valenzuela lost a point from referee Steve Willis after a blatant low blow that followed several complaints from the Santa Rosalia native for low shots. Harrison put his foot on the gas in the seventh, rocking Valenzuela with several flush blows before getting stunned himself midway through the frame. Seeing his chance, Valenzuela went on the attack but ran out of gas, and then it was Harrison's turn, but when Valenzuela lost his mouthpiece, it earned him some key seconds to recover and he was able to make it through the round and the rest of the fight. WBO featherweight champion Cindy Serrano stayed busy against Hungary's Edina Kiss, winning an eight-round split decision in a non-title junior lightweight matchup. Scores were 78-74, 79-73 and a bizarre 74-78 for Brooklyn's Serrano, now 27-5-3 with 10 KOs. Kiss falls to 13-6 with 7 KOs. The pattern of the bout was established in the opening round and never wavered, as Serrano was too quick and technically sound for the aggressive Kiss, who is now 0-3 against the Serrano sisters, having been stopped twice by five-division world champ Amanda. In a clash of unbeaten junior middleweights, Brooklyn's Chordale Booker rose to the occasion in his biggest fight to date, dropping Long Beach's Malcolm McAllister once en route to an eight-round unanimous decision victory. Scores were 79-72 and 78-73 twice for Booker, now 8-0 with 4 KOs. McAllister falls 9-1 with 8 stops. Working behind a right hand that did it all from the southpaw stance, Booker was just a little too quick for McAllister, who still kept the pressure on throughout the bout. In the seventh, Booker dropped McAllister hard and looked to have him in deep trouble, but the Californian rattled the New Yorker a couple of times in the final round before Booker finished strong to seal the victory. Brooklyn welterweight prospect Richardson Hitchins improved to 3-0 (1 KO) with a shutout four-round decision over Sunbury, PA's Jordan Morales (2-3, 2 KOs). Scores were 40-36 across the board. In control from the start, Hitchins had little difficulty figuring his foe out in the first two rounds, and while the gutsy Morales was fighting on fumes in the final two frames, he was able to make it to the final bell. Unbeaten heavyweight George Arias passed a gut check in his bout with Mario Heredia, as he rose from the canvas to stop an opponent that outweighed him by 59 pounds in the fifth round of a scheduled eight. Arias stayed busy and wisely focused on the body of his 289-pound opponent in the opening round, but in the second, a right uppercut dropped the Bronx native for a short count. Arias let his hands go in an attempt to get the extra point back, but whenever Heredia was able to pin him against the ropes, he was able to bully the local favorite. Dropping his hands and showboating in the third, Arias was actually able to have success by potshotting the San Diegan, allowing him to put the round in the bank. Arias got it back a round later, though, as he drilled the New Yorker at close range over the next three minutes. Round five was big one for Heredia in the first half, as he drilled Arias with several unanswered right hands. But just when it looked like Arias was done, a spent Heredia wound up on the receiving end for the rest of the round, and at the end of the frame, the bout was called off by the ringside physician. The official time was 2:59 of the fifth round. With the win, Arias moves to 9-0 with 5 KOs; Heredia falls to 14-6 with 12 KOs.